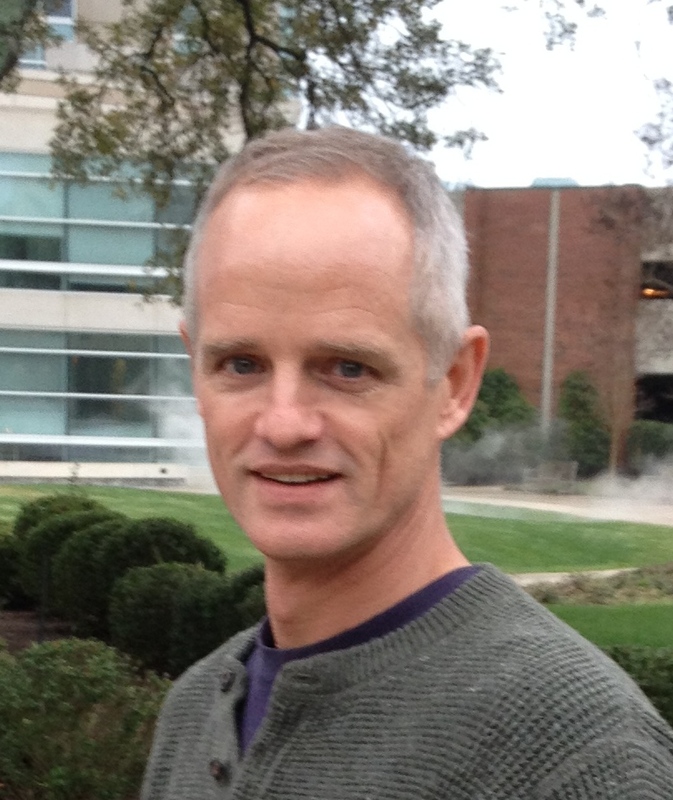 This is the lab page of David T Blake, PhD. The lab investigates questions concerning brain electrophysiology and behavior. The most recent focus has been on cholinergic deep brain stimulation, its physiological and behavioral effects, and the potential to use such deep brain stimulation to treat neurological disorders. Honestly, I think it is going to cure Alzheimer's, and by that I mean its application in patients will prevent cognitive decline from altering their activities of daily living. How is learning expressed in areas of the cerebral cortex that are wired differently e.g., sensory vs association cortex, i and how is learning modulated by acetylcholine, dopamine, and noradrenaline? Weeks of application of deep brain stimulation can dramatically improve executive function even in fully functioning young adults. Can it do the same in Alzheimer's patients? What do we need to know about learning rules in sensory cortex to build machine learning models that perform human-equivalent sensory discrimination? What are the cell biological pathways involved in instantiating those learning rules? What are the machine learning concepts embodied by those learning rules? What are their limitations? Mathematically, how can we optimize them? And how can we combine them with other neural network concepts to build a biologically based machine learning network that performs human equivalent sensory discrimination? Or discrimination that is better than human equivalent? Scholars interested in pursuing any of these ongoing directions should get in touch. To find a list of papers, try Pubmed or Google scholar. I have a webpage at GRU also, but I urge people to consider this web site as more likely up to date. I did my PhD at Johns Hopkins in Biomedical Engineering. The lab was Kenneth Johnson's, and Steve Hsiao was an Assistant Professor in the same lab. We began work on the 10th floor of PCTB, and moved the lab around 1993 to the Krieger Mind/Brain Institute. My work was on the neural basis of tactile roughness perception and resulted in several manuscripts with Ken and Steve. Touch has been a mainstay of my research since then, although the questions have revolved around neuroplasticity. Ken and Steve both passed away from cancer far too young, and I miss them and their unique approaches to neuroscience. In 1996, I went to the lab of Michael Merzenich. There, with R. Christopher deCharms, we succeeded in developing one of the earliest high yield sensory cortex implants. The following experiments, done also with fabrizio strata, Anne Churchland, and Richard Kempter, were among the first to resample, with high spatial resolution, the same cortical locations throughout a period of learning. The discoveries that followed were unexpected. A robust nonselective response enhancement occurred within 24 hours of the time that an animal learned to associate a new sensory stimulus with reward. Over longer periods of time, the representations of stimuli associated with omission of reward, or task distractors, became selectively suppressed. Surprisingly, any tendency for the representations of targets to be enhanced, relative to the representations of control stimuli, were weak or absent. The following figure, taken from Blake et al 2002, shows the rapidity and strength of the nonselective response enhancement. Cortical responses double in 24 hours after learning. In 2006, I moved to Augusta University. Following work in the lab demonstrated that the neuroplasticity required a cognitive association between the sensory stimuli and reward and not simple stimulus-reward pairing. 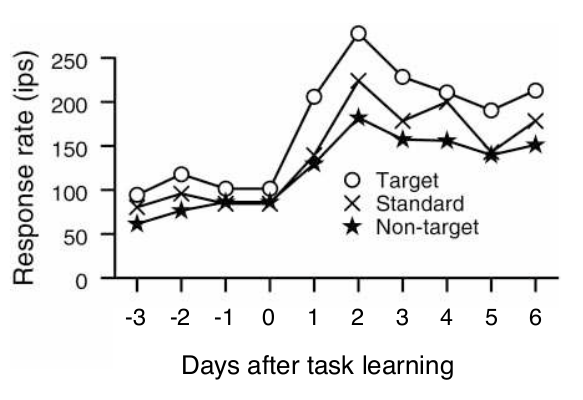 Work led by Elsie Spingath with Fred Kang found that the nonselective response enhancement was specific to forming the association between the target and the reward, while the responses to the task distractor became selectively suppressed. The neuroplasticity phenomena were observed in macaque somatosensory cortex, to be added to owl monkey somatosensory and auditory cortex, and rodent auditory cortex (by Zeke Carpenter-Hyland). The same mechanisms are at work in each system, and to our ability to sample responses, the plasticity effects are identical. One future direction, a close collaboration with Almira Vazdarjanova, is investigating the pharmacological and cell biological basis of the changes in neural responses after learning. A second direction is re-analyzing plasticity during the same behaviors in association cortex. A third direction is bringing the discovered learning rules into register with current work on machine learning in pattern recognition. Christos Constantinidis (Wake Forest) and I began collaborating in 2008 on studies investigating learning and pharmacology using cortical implants in dorsolateral prefrontal cortex. These studies are ongoing, and are assessing the potential for deep brain stimulation to positively impact executive function, and the neuropharmacological profile of those effects. A few papers are now published from this collaboration. Based on our observations that a few months of deep brain stimulation can enormously improve executive function, we are re-directing our studies to study cognition in aging and Alzheimer's Disease. Contact me at dblake.mcg AT gmail DOT com, or call the office 706-721-9399. Email is preferred, and if you want a phone call, please email to set one up.